This Property is 100 Pct. Non-Smoking The Embassy Suites Orlando - Downtown hotel is conveniently situated in the heart of downtown Orlando Florida. Our hotel is located ten miles from Orlando International Airport within walking distance from Florida A-M University and just a short drive from the Orlando Orange County Convention Center as well as top Orlando vacation destinations including SeaWorld Orlando Universal Studios Orlando Florida Amway Arena home of the Orlando Magic Walt Disney World and the Orlando Museum of Art. Guests of the Embassy Suites Orlando - Downtown hotel stay in spacious two-room suites and receive a complimentary cooked-to-order breakfast and a nightly manager*s reception. High-speed Internet access is also available throughout the hotel for an additional fee. A shuttle is available for complimentary transportation on a first-come first-served basis and will take you to destinations within a three-mile radius of the hotel. 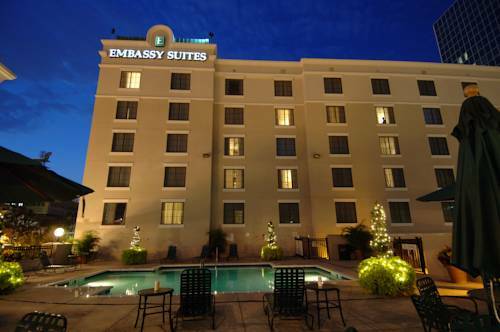 For a convenient downtown location comfortable rooms and excellent service in Orlando Florida - join us at the Embassy Suites Orlando - Downtown hotel. ALL RESERVATIONS MUST BE CANCELLED 24 HOURS PRIOR TO ARRIVAL HOST TIME IF THIS RESERVATION HAS BEEN MADE ELECTRONICALLY PLEASE CANCEL IT ELECTRONICALLY TO AVOID CONFUSION AND A NO SHOW BILL. Policy is subject to change. Upscale steakhouse overlooking beautiful Lake Eola in downtown Orlando Florida. Extensive menu including unique cocktails and extensive wine selection. Main dining room features a spectacular cold tapas bar. Seafood Dining in Thornton Park near downtown Orlando Florida. Famous pulled pork sandwiches and lip-smacking baby back ribs Wildside slow smokes BBQ daily with a dry-rub seasoning and topped with famous secret BBQ sauce. An extensive menu that includes signature salads fresh fish pasta dishes and much more. Cafe style seating great food extensive wine list and full bar.